Honey I Shrunk The Kids, but make it fashion. Mini handbags have been reigning supreme for the past few seasons, but the trend continues to shrink smaller and smaller. Kicking off Paris Fashion Week, Jacquemus debuted the teeniest, tiniest handbags on its Fall 2019 runway. The fashion brand has already become known for its ultra-mini bags and fanny packs. But it ventured into new territory with handbags so small they can barely fit a single pair of Airpods. Leave all your baggage behind in last season, hunny! Before its latest micro bags hit the runway, the show's invites appropriately came in mini lavender Jacquemus bags and envelopes. In the collection, the bags accompanied bold monochromatic looks in striking pinks and reds. Aptly called the 'Mini Le Chiquito bag,' the accessory debuted in white, pink, and red colorways. The perfect size for fitting two Advil, a single piece of gum, and perhaps a pair of Airpods (if you're lucky), this is the definition of leaving your baggage at the door. 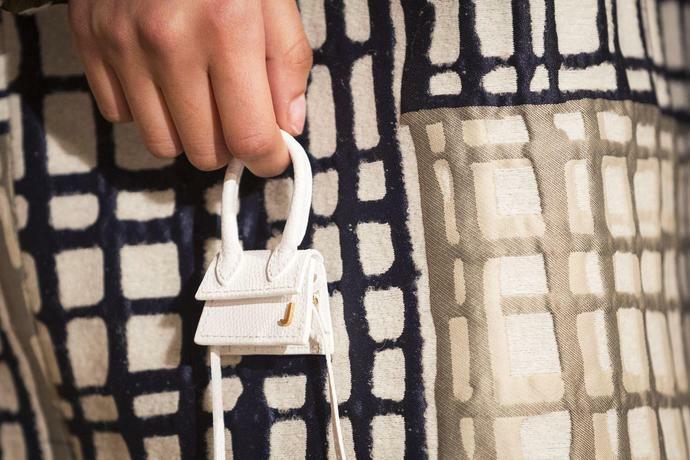 While the latest mini Jacquemus bags won't be available to shop until next season, its current in-season collection of micro bags range in price from $345 - $795. Ah, fash-un!